Cream the butter and sugar, add salt. Add the flour and almond powder and mix to a paste. Let it rest for an hour and roll out. Bake at 170˚C for 12 minutes. Temper the milk chocolate and cocoa butter. Mix with almond praline, sable and feuilltine. Roll to 5 mm and cut out. 1. Heat the cream and invert sugar. 2. Form an emulsion with both of the chocolates and the cream. 3. Blend and add soft butter. 4. 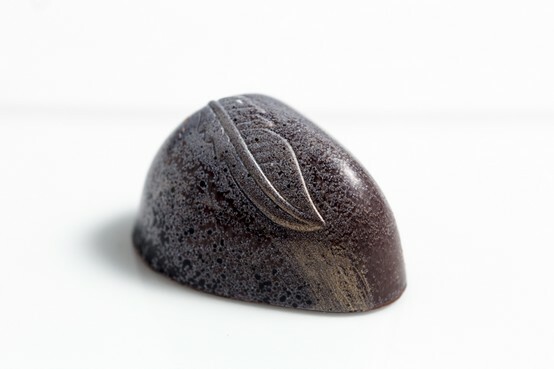 Pipe into the chocolate mould lined with Cacao Barry® Cuba. Mix the pectin with sugar. Warm the liquid to 45°C. Mix in the sugar and pectin. Pour on a tray and allow to cool.